Banana and peach cobbler takes less than 1 hour to prepare. With 17g of fat, this is the perfect Keto snack to indulge at home. 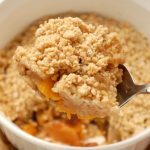 Mix white peaches, bananas, 2 tablespoons flour, and 1 teaspoon sugar substitute in a bowl until the fruit is coated; spread into the bottom of the prepared baking dish. Whisk 1 cup flour, baking powder, salt, and cinnamon in the same bowl used to mix fruit;stir in almond milk, egg, corn oil, 2 teaspoons sugar substitute, and vanilla extract to make a batter. Pour batter in an even layer over the fruit. Bake in the preheated oven until cake is golden brown and a toothpick inserted into the middle of the cake layer comes out clean, about 30 minutes. Cool in pan on rack at least 20 minutes before serving.